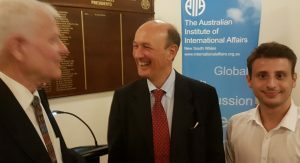 On Tuesday 12 March Argentinian Ambassador Dr. Hugo Gobbi gave a presentation at the Institute on the topic of Argentinian’s Group of Twenty (G20) Presidency and the 2018 G20 Buenos Aires summit. After completing a PhD in Political Science from the Université Catholique de Louvain, Belgium, in 1985 His Excellency joined the Argentinian Foreign Service Institute, serving in a range of high-profile diplomatic and economic policy positions. He has been the Ambassador of the Argentine Republic to Australia since 2016. Argentina’s Presidency at the G20 coincided with growing fragmentation in the international system, which presented a distinct challenge to the robustness of international organisations and forums. In this context, as Ambassador Gobbi emphasised, Argentina took on its Presidency with great responsibility and cogency, focusing on promoting cooperative action on a range of pressing international issues. The Ambassador said that the Argentinian leadership at G20 prioritised four areas for the forum to address: 1) the future of work and education; 2) food security; 3) infrastructure for development; and 4) gender equality and female empowerment. Argentina, in its Presidential capacity, sought to help bolster the forum’s effectiveness and inclusiveness, pursuing, for example, increased participation of regional organisations and engagement groups. Moreover, this being the first time that a G20 Summit has been held on the South American continent, the Ambassador touched on the regional significance of having a South American voice leading the summit. As Ambassador Gobbi put it, assuming responsibility for the Presidency gave Argentina the opportunity to showcase its positive outlook on globalisation and its commitment to global governance, multilateral cooperation and a rules-based international system. In its Presidency, Argentina emphasised the need for consensus, which is grounded in its belief in that there are numerous common international interests. The Ambassador further noted that the G20 retains its place as forum of fundamental significance to international dialogue, highlighting that it facilitates the opportunity for conversations between some of the world’s most important statesmen and diplomats – both bilaterally and multilaterally. Lastly, Ambassador Gobbi commended and thanked Australia for its support of the Argentinian Presidency of the G20. It was only recently (2014) that the G20 Summit was held in Brisbane. The Ambassador affirmed that it is Australia’s and Argentina’s mutual commitment to free trade, multilateralism and international cooperation that make these two countries, geographically distant, diplomatically close by virtue of shared values.